From On top of the Hill : Fixated Persons Law - Asphyxiate the Fixated! Two states have passed legislation regarding "Fixated Individuals". Both New South Wales and Queensland have recently passed laws under the guise they are protecting people from terrorism with these measures. I am quite suspicious of this fact. These laws have been used to shut people up who speak out about corruption where government and corporations are concerned. For example. The young woman in Queensland Ms Fiona Wilson who blew the whistle on Origin Energy. More on Queensland laws and Ms Wilson later. The following is an article written on the Sydney Criminal Lawyers Website regarding the New South Wales version of this same law written by By Zeb Holmes and Ugur Nedim. The opening paragraph says it all. 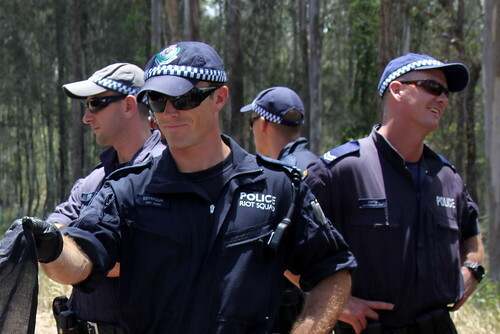 A new unit of the NSW Police Force has been created which is ostensibly aimed at combating lone-wolf terrorism by closely monitoring ‘fixated persons’. The NSW Police Commissioner Mick Fuller said there is this new phenomena with people who become fixated on particular issues or particular people who are related to particular issues. This is so broad that I find it concerning to say the least. It seems as I said above, this is a smoke screen to fool the general public into believing its about stopping terrorism. It is clear its not because they target people who speak out about corruption that in some way may link the government to the corrupt acts. We see this with Fiona Wilson in Brisbane. Her next court case is on March 9. Her case is bizarre to the onlooker. Is this the Australia and the freedom our grandfathers fought and died for? Somehow I do not think so and when the RSL hierarchy has been found corrupt last year; then you have no chance of bringing morality to the pointless deaths of thousands over the various wars governments create. IMPLIED RIGHT - implied right are derived from the rulings and constitutional interpretation of the High Court. Implied rights are not clearly outlined in the Constitution but are suggested or inferred in its text. In a manner of speaking, implied rights are found by ‘reading between the lines’ of the Constitution. They are derived from a particular definition or interpretation of key words or phrases. Implied rights are considered, identified and outlined by the High Court, in cases the court is required to interpret the Constitution. While you are there, you might be wondering about how people stand with the law when it comes to protesting any of this legislation. Notwithstanding the occasional recognition of protest as an object for legal protection, many of the cases illustrate the difficulty of balancing this with other interests at stake, notably public amenity, health or safety. The lofty rhetoric of speech protection rarely translates to legal success for protestors in a constitutional context. Conceptually, protest straddles categories ranging from speech to association and assembly, but it also struggles to achieve constitutional protection when operating as a ‘strategy of rupture’. Thirdly, protest is protected in various statutes regulating police powers, public order and local government. An example of such protection is found in section 200 of the Law Enforcement (Powers and Responsibilities) Act 2002 in NSW. The accompanying section 199 creates an offence for failure to comply with a direction. Section 200 provides that a police officer is not authorised to give such a direction in relation to ‘an apparently genuine demonstration or protest’. The difficulty with these kinds of laws is that they are often subject to the discretion of relevant authorities. You might end up being able to establish your ‘right’ to protest in any given context, but this could involve significant legal risk, the possibility of arrest and conviction or civil penalty. Protest can make history, it can speak truth to power, it can change the legal system itself, but it is indirectly and rather poorly protected. Protest, like democracy, is often messy, disruptive, inconvenient and even annoying, but as with free speech more broadly, it deserves more formal recognition and legal protection in Australia. Read the article in full at this link below. Now, finally back to Fiona Wilson. This Go Fund Me post came in my feed this morning and so it didn't take long to link the two states together with these similar laws. Former Origin Energy executive and whistleblower Fiona Wilson has been detained by the new Queensland Fixated Threat Assessment Centre (QFTAC) and injected against her will and without any charges laid against her. Fiona is appealing this and the next hearing is on March 9 in Brisbane. Fiona needs a barrister to represent her in court as the case is now very complex. It is the opinion of an independent Clinical and Consulting Psychologist, and a qualified Counsellor, that Fiona was/is suffering from Post Traumatic Stress Disorder (PTSD) following the ordeal of blowing the whistle on the coal seam gas industry - and is NOT delusional, as the QFTAC have claimed. The QFTAC are interpreting very broad definitions in Fiona's case. Fiona was merely trying to contact the relevant Queensland Minister about the evidence that she was exposing. Instead of acting on Fiona's evidence, the Minister referred her to QFTAC. https://twitter.com/1earthmedia/status/956336176016732160?lang=enProactive intelligence agencies undoubtedly have their place, particularly in an ever-more-sophisticated world of anti-government activity. But so, of course, do concepts of open government, transparent and accountable law enforcement, and the right to dissent. Chris Nyst, Gold Coast Lawyer. https://www.nystlegal.com.au/2017/05/26/fixated-folk/Fiona has since moved hundreds of kilometres away from Brisbane to begin a new life with her partner, but is still trapped in this new system. Fiona has exhausted her bank account fighting this to date but now needs a barrister to appeal the QFTAC's harsh new laws. The best thing that people can do, is to do themselves and Australia a favour by learning their rights from The Commonwealth Constitution. Do not listen to the last post from Andrew Mary. the Lawyer. All Lawyers swear a oath to the Court System which is Corrupt and as soon as your take on a Lawyer to Represent you, you waiver your right to Speak for yourself. Learn the Constitution because it is powerful and where the people of Australia's Rights are. I agree Helena. Knowledge is power and our Commonwealth Constitution (not the Australian constitution) is where our power lies. Wake up Australia! !